Let’s talk Cambridge prince names. Because sometime soon, William and Kate – that’s the Duke and Duchess of Cambridge, officially – will welcome their third child together. And we can’t wait to hear what they’ll choose for his name. The baby will almost certainly receive three names, all drawn from their family trees. The child’s first name will be thoroughly royal; it’s possible they might stray slightly farther from the tried-and-true for the middles. Names in use by others in their generation are almost certainly out. Since William’s Uncle Edward is dad to Louise and James, those two names can be crossed off – at least as first names. 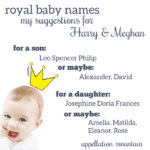 I think it’s somewhat unlikely that they’ll repeat any of their own children’s names, so I doubt we’ll have a Prince Louis or a Princess Elizabeth. Cambridge Prince Names: A Short ShortList! While compiling the girls’ list, I realized that Will and Kate don’t have many options. That means one of two things: first, we could very well know the baby’s name already. If they stick to their established pattern, their options are so limited that it’s easy to guess. Or maybe – just maybe! – it means the couple will search slightly farther afield for a name that’s appropriate, but not quite as expected. It’s said that Prince Charles, Will’s dad, liked this name quite a bit for his sons, but Diana dismissed it as too old. Times change, though, and Albert feels fresh once again. In fact, it’s a rising Top 100 name in England & Wales, along with nickname Albie. It’s impeccably royal, thanks to Prince Albert, the husband of Queen Victoria. It’s appeared in nearly every generation since then. In fact, Will’s brother, Prince Harry, is Henry Charles Albert David. All of this makes Albert one of the most promising picks on this list. Read more about Albert here. If not Albert, then Arthur seems like the most likely choice for a brother for George and Charlotte. It’s a still match, of course. But it’s also nicely royal. There’s never been a King Arthur – not counting the legendary one – but there was a Prince of Wales by the name. (Henry VIII’s older brother was Arthur.) Plus, the family seems to prefer mainstream favorites, which puts Top 50 Arthur solidly on the shortlist. I’d love to hear a birth announcement for a little Prince Freddie! Again, this name checks plenty of boxes. It’s not in use by a member of the current generation, but feels nicely British and appropriately royal. 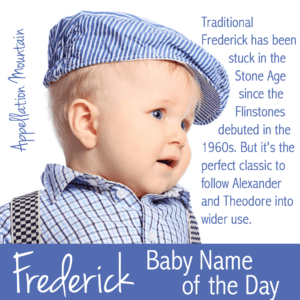 Frederick is a favorite in England, just like George and Charlotte. And Freddie is actually a Top 20 pick. One reason I don’t think Frederick is more likely: it’s not clear how Will and Kate feel about nicknames. Because Frederick would immediately be Freddie to everyone. So perhaps that moves this name to the middles-only list. James seems like a lock, a name that must be on the Cambridge’s shortlist. Except. As I mentioned earlier, Will’s Uncle Edward has a son named James. James was born in 2007, so even though he and Will are cousins, James is much closer in age to Charlotte and George. So that could easily drop James from likely first to possible middle. Henry feels impeccably regal – there have been eight kings by the name in Great Britain alone! – and yet stylish, too. It’s the obvious name for the royal family. And yet, it’s very much taken. That’s because it’s Prince Harry’s birth name. In many families, naming after an uncle would be considered an honor, but I suspect this family might see it as a source of confusion instead. (And when your names make headlines every week, that’s no small consideration.) Of course, Harry has never used his formal name, so maybe it is up for grabs. We see Louis as royal. In France? That’s so very true. But it’s not quite as solidly to the purple born in England. 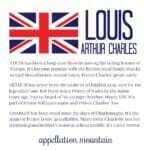 Will’s full name is William Arthur Philip Louis, but the Louis was a nod to Prince Charles’ great-uncle, the late Lord Mountbatten, to whom he was quite close. Still, they’ve passed it on to George as his second middle, so it feels very House of Windsor these days. The problem? Well, they’ve already used it for George, and seem unlikely to repeat. Things that baffle me: why classic Peter isn’t more popular throughout the English-speaking world. Peter does appear on the extended family trees of various royals. But it makes this list because Peter is also Kate’s grandfather, who once served as co-pilot to Will’s grandfather, Prince Philip. That strikes me as an appealing connection, and since Will’s family is so thoroughly honored with their first two children’s names, maybe it’s time for a little more Middleton history to influence their choice. All this talk of Prince Philip brings us to his given name. 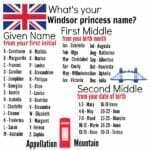 Again, it’s quite royal elsewhere in Europe, but has mostly been a middle name in the UK. (Like William Arthur Philip Louis.) Still, that doesn’t rule it out – especially for a younger child, far less likely to ever succeed to the throne. Instead, I think Philip moves to the middle spot for another reason: it’s considered rather dated on both sides of the Atlantic, and the Cambridges seem to favor Top 100 names. Read more about Philip here. At first glance, Richard meets the criteria: worn by kings aplenty, but not in use in the current generation. But on closer inspection, I think Richard might be considered unusable. That’s because one of those kings is considered a villain. Shakespeare immortalized Richard III as a tyrant. While that may be unfair – or at least, not entirely accurate – the image stands. The British royals don’t do juniors. Sure, they may take the name of their predecessors when they’re crowned king. But in regular life, they tend to avoid repetition. So that makes William a long-shot for a son. And yet, it ticks every other box – traditional, popular, accessible. It’s a name that never goes out of style. But I think I’ll save this one for my list of possible names for Prince George’s firstborn. I’ve mentioned a few likely middles already, like Frederick and James. I also think William might be part of the prince’s full name. But the name I’m watching most closely for a middle: Michael, as in Michael Middleton, father to Kate. After all, Charlotte’s middle honors Will’s mum. So it feels quite fair that a second son would receive Kate’s dad’s name as a middle. Michael also qualifies as royal-lite. It’s not found in the immediate British royal family, but follow a branch or two, and you’ll see it used as a middle and a first. Others in this category: Christian and Patrick. Or maybe they’ll use David as a middle name. It was the preferred name of King Edward VIII, born Edward Albert Christian George Andrew Patrick David, but always known to friends and family by the last of those names. Since Edward VIII abdicated to marry Wallis Simpson, it might carry some baggage. But as a middle name, I think it works. And Prince Harry is Henry Charles Albert David, so it’s been used since then. If the newest royal baby is a boy, I’m betting Michael will be among the middles. And the first name almost has to be Albert or Arthur. I’m tempted to bet on Albert Michael Philip, though the rhythm of three two-syllable names in a row seems a little choppy. That makes me ponder something like Albert James Michael, or maybe Arthur Henry Michael. With another couple, I might have guessed Arthur Leopold Michael, or Arthur Leopold James. But Will and Kate seem to favor names that read as thoroughly British, so that makes me think Leopold might be saved for Meghan and Harry. What do you think? Have I overlooked an obvious combination – or a possible name entirely? Let’s hear your best guesses for Cambridge prince names! Why do you think Spencer or Francis would completely off the table for middle names. I don’t think they’re COMPLETELY off the table. But I do think they’ve honored Diana directly with one of Charlotte’s middles, so I’d guess they’d want to honor the Middletons. And I’ll be pretty surprised if Philip isn’t in the name somewhere. So … those probably take up the middle spots: Philip Michael. And I can’t see Spencer as a first name. Francis would be a maybe, BUT it’s fairly obscure in England right now. And my gut is that they’ll choose something mainstream, almost certainly Top 100. So that makes Francis a long-shot, too. But hey … I am prepared to be wrong, and would be delighted if they surprised us! Philip could also be a way to honour Pippa Middleton, whose given name is Philippa. Though I suppose they’ve already done that with Charlotte (Pippa’s middle name). Similarly, James would be a way of honouring Kate’s brother. I think I agree with your prediction for either Albert or Arthur, though. I wouldn’t be surprised to see Philip and/or James as middles, though. William Philip really has a great ring to it for middle names. I have no idea what they’ll choose for a first name! Arthur William Philip maybe? Arthur definitely feels right for them stylistically. It kind of bothers me that Charlotte and Arthur both have the “ar” sound though. I hope it’s a girl 🙂 Charlotte is just tooo cute! Coming back here to add, I think that if it’s a boy, they’ll follow the middle pattern they set for Charlotte. Elizabeth (Great-grandma) and Diana (Grandma). 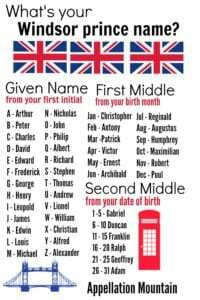 So I’m going to say his middles would be Philip Charles. I love Albert, and all it’s possible nicknames – but *Prince* Albert? I feel that has connotations that might, uh, pierce its chances of success as a royal choice! Albert is my favorite here. If the Duke and Duchess follow the lead set by Charles and Diana then one of the middle names of the new addition to the family (if it is a boy that is) will be William, as for the first name I’d like to think Thomas, Rupert and Ernest are on the list. Prince Thomas William Michael has a certain ring to it, doesn’t it? Good point about William – I didn’t even consider the possibility of William as a middle. I figured if they skipped it for George, surely they wouldn’t consider it for a younger son. It seems like the kind of thing you might just rule out for good, right? But maybe not. 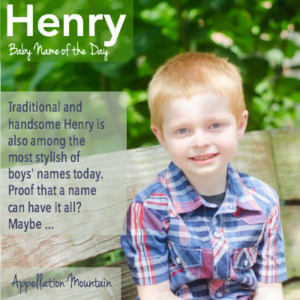 And great boy names are in short supply! It is more common in the UK (particularly in the upperclass) fo younger sons, again particularly the second son to get the father’s first name as a middle name. It’s probably due to the fact that juniors are so uncommon over here or maybe it’s because it’s the tradition to give second sons the fathers’ first as a middle that juniors are so uncommon, I don’t know? Interesting, Lauren – thanks for the insight! I love your ideas, Abby! Yet, remember that the queen’s husband is Philip, so that would mean repeating names. And naming this baby Frederick would mean Will and Kate would have a Fred and a George. To me, the Harry Potter reference is too strong. Oh, good point about Philip! And yes, the Weasley twins! I guess that makes it a no … too bad! I also really like Albert, especially after watching the drama “Victoria” where her husband and one of her sons is named Albert. Bertie is adorable for a nickname. 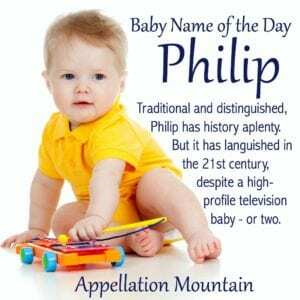 I think Philip definitely needs to be used as an honor middle name. I don’t know about a second middle name. I’d hope by their 3rd child they would be able to choose something more unexpected and a little less traditional. Something with personal meaning or just a name they really like.